Update on the French family triplets and their sister. Read Vincent French's letter. Mark and Muriel Dickinson and Ralph and Mia Yohe, who are friends from Braintree, join Jack and Marci for lunch in Las Vegas. The two couples were active in the Dianne DeVanna Center and big supporters of Wednesdays Child. They were in town to watch the Pac 12 basketball tournament. There was something about the story that haunted me immediately: an eleven year old girl beaten to death by her father and step mother only a day after a judge ordered her return to her father's care. Her name was Dianne DeVanna. She had been tied to the rafters upside down and beaten to death with a bread board. Jack went to Braintree to cover the tragedy, the first of many trips there to update the investigation. He and Marci contributed money to help buy the little girl a headstone. Later the Dianne DeVanna Center was founded and the Williams' contributed hundreds of thousands of dollars over the years. The fall of 2018 in Braintree people jammed the town hall to remember what had been done in Dianne's name. The event was hosted by Braintree Mayor Joseph Sullivan and Jack and Marci Williams were the featured speakers. Forty years of success stories were shared and once again people vowed to not let the world forget about this precious little girl. Marci said she too was haunted by the story and encouraged Jack to keep on it. 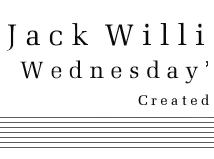 Jack said it was a big reason why Wednesdays Child was started three years later. When Claire Bogrette died last year, Wednesday's Child was notified by her attorneys that the bulk of her estate was to be given to help special needs children through the Jack and Marci Williams Endowment for Wednesday's Child. The largest amount came from the sale of her house in Westwood. It amounts to several hundred thousand dollars for the charity. Though neither he nor Marci had ever met Claire, this kind and quiet woman decided she wanted to make a difference. Over the years she had followed the progress of Wednesday's Child and her heart went out to these children who face life alone, without families. Both Marci and I and our entire board are overwhelmed by her generosity. 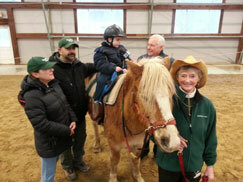 Each year the Endowment gives over $350,000 in grants to group homes in Massachusetts and New Hampshire. In 2015, St. Ann's Home in Methuen named a new $7-million building on the campus in honor of Jack and Marci Williams. The facility and staff work with some of the children who face the most challenges in helping them develop a healthy life with a loving adoptive family. Less than five months after his beloved wife Daphne died, Tom Corcoran died tonight after being hospitalized today. He had stage 4 liver cancer. 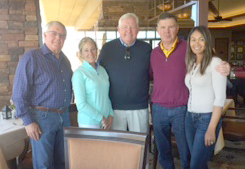 Tom and Daphne hosted 30 fundraising events at Waterville Valley and were instrumental in getting Volvo as a major sponsor for Wednesday's Child. In all they helped us raise almost $10-million for special needs adoption. I saw Tom at last week's memorial for Daphne. He knew how much we all loved and appreciate them both. I spoke at the memorial. Daphne Corcoran died at home February 11, 2017 in South Carolina, where they moved after all those fabulous decades in Waterville Valley, NH. They were our neighbors and we had a ball with them, traveling extensively, sailing, skiing and raising hell. On the more sedate side, Daphne and Tom, as owners of Waterville Valley, helped us to raise millions for Wednesday's Child with our 30 years of the Wednesday's Child ski race. She was always full of life and was one of the best entertainers I have ever met. She never tired of throwing a party, fixing a meal, lighting a fire or having a drink or two. Then it was on to sleigh rides, late night cross country skiing, or rowing ashore from the Snowdance in some Maine harbor to find more fun and giggles. She was just a little thing and she and Tom made a near perfect couple. Thank you Daphne and Tom. St. Ann's in Methuen is a leader in the care of special needs children and helping them find adoptive homes. Hundreds of Wednesday's Children came from this marvelous facility. Here's the link to the addendum giving more details about the dedication ceremony on June 3rd. 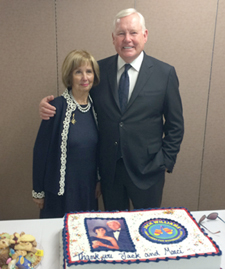 Jack & Marci Williams at the dedication ceremony in early June. 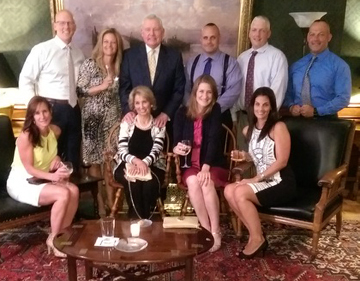 Jack Williams was honored as a 2015 “New Englander of the Year” by the New England Council. The award is in recognition of his remarkable career as one of our region’s most respected television news anchors, as well as his tireless work to help children find adoptive families through Wednesday’s Child. Read the letter here! 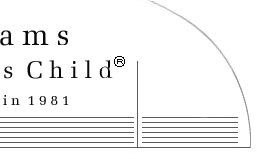 2015 Wednesday Child grants have been sent totalling $455,000! Also, Marci and I are proud that we were ahead of the curve when we established a scholarship at the University of Oregon with preference given for students who have benefitted from adoption or foster family care services. It is fully funded and will continue in perpetuity. In the latest Oregon Quarterly there is a lengthy article on former foster kids who have prospered at the University of Oregon. Our scholarship was established with personal funds and has no ties with the Jack and Marci Williams Endowment for Wednesday's Child (which focuses on group homes in New England looking after special needs kids awaiting adoptive homes). FITNESS CHALLENGE A BIG SUCCESS! More than 600 very fit athletes from all over Southern New England gathered at Gillette Stadium in late September for a tremendous event. Wednesday's Child is one of four charities to benefit from the money raised. Many thanks to Metro Swat for putting on the event and thinking of special needs kids. The date was the night of September 27th-28th. 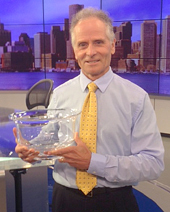 Meteorologist Barry Burbank of WBZ-TV was given the Ruthie Antonides Volunteer Award for 2014 after giving all of his speech money to Wednesday’s Child. Over the years it has amounted to tens of thousands of dollars. Barry praised the school children who wanted to help Wednesday’s Child and raised money with bake sales, giving up their allowances and other events. Barry has been visiting schools for years, getting youngsters interested in meteorology. Barry has been a top talent at WBZ TV for 37 years. Ruthie Antonides was a volunteer for 24 years at the annual Jack Williams Ski Race for Wednesday’s Child. She died of cancer but her last thoughts were of the kids who need adoptive homes. 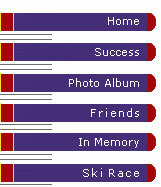 Please visit In Memory page for more. 5th graders at the Horace Mann School in Newton held a bake sale for Wednesday’s child and raised $391.86. In Worcester, at the Columbus Park Prep Academy, they donated their allowances for two months and sent Wednesday’s Child a check for $300. Another successful year for the Wendy's Wednesday's Child coupon campaign. Jack was on hand in Westford, MA. Tuesday, March 25th, at the Wendy's managers rally. He was given a check for $180,000 for Wednesday's child, the amount raised by customers buying $1 coupon books at Wendy's stores in Massachusetts and New Hampshire. Over the years, Wendy's has raised more than $3-million for Wednesday's Child. every Wednesday’s night on the 6:00 news on WBZ-TV. 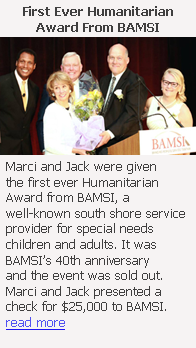 Jack & Marci Williams were selected by the Board of Trustees and Board of Directors to receive Spaulding Youth Center’s 9th annual You’ve Got a Friend Award, presented Oct. 17th 2013 at their 55th annual celebration. Continuing a proud tradition of recognizing people or groups that have made Waterville Valley Resort the very special place it is, the 2nd annual Waterville Valley Hall of Fame induction awards ceremony and dinner took place on Saturday, April 6th at the Waterville Valley Conference Center. The 2013 class of inductees included honorees that have had a significant and long term impact on the legacy of Waterville Valley. Over the years Ann Finucane has helped raise money for Wednesday’s Child and special needs adoption. Ann, an official at Bank of America, had directed contributions from Bank of America as well as other sources to help provide care and eventually adoptive homes for these children. She has done so quietly, with dignity and compassion. She is shown in the picture with John Collins a member of the Wednesday’s Child board and treasurer of the Jack and Marci Williams Endowment for Wednesday’s Child. For 20 years, American Airlines has been the official carrier of Wednesdays Child and has helped raise hundreds of thousands of dollars for special needs adoption.